On February 15, 2019, the board of directors (the “Board”) of Driven Deliveries, Inc. (the “Company”) appointed Jerrin James as Chief Operating Officer, with such appointment to take effect immediately. Mr. James, age 33, is an accomplished global logistics and supply chain executive. Since June of 2014, Mr. James has served as Vice President of Global Logistics and Supply Chain at Facebook, Inc. From March through June of 2014, Mr. James served as Senior Director and Head of Logistics, Merchandising and Fulfillment at Groupon, Inc. From June 2011 through February 2014, Mr. James served as Senior Pathways Operations Manager at Amazon. Mr. James also holds an IMBA from the Moore School of Business at the University of South Carolina and a BS in Engineering, Electronics and Telecommunications from Sathyabama University where he graduated first in his class. There are no arrangements or understandings between Mr. James and any other person pursuant to which Mr. James was selected as an officer. Also, there is no family relationship between Mr. James and any director or executive officer, of the Company. On February 14, 2019, the board of directors (the “Board”) of DropCar, Inc. (the “Company”) approved (1) the termination of Paul Commons as Chief Financial Officer of the Company and any other positions on which he serves with respect to the Company and its subsidiaries and affiliates, and (2) the appointment of Mark Corrao as the Company’s new Chief Financial Officer, in each case effective as of February 28, 2019. Mr. Corrao, age 61, has served as Chief Financial Officer of KannaLife Sciences, Inc. since 2012. Prior to that time, Mr. Corrao served as Chief Financial Officer of each of Business Efficiency Experts, Inc., from 2010 through 2012, StrikeForce Technologies, Inc., from 2001 through 2010, and Advanced Communication Sciences, Inc. from 1997 through 2000. Mr. Corrao also has experience in accounting, having previously served as a partner at Frank T. LaFauci, CPAs, as controller at Design Production Management, Inc., as assistant controller at Greenfield Arbitrage Partners, as internal auditor at Spear, Leeds & Kellogg and as an accountant at A.L. Wellen & Co., CPAs. He holds a B.S. in Public Accounting from the City University of New York – Brooklyn College. Mr. Corrao is employed in at-will capacity and does not have an employment agreement with the Company. As consideration for his services to the Company, Mr. Corrao will receive compensation in the amount of $1,500 per month. Mr. Corrao has no family relationships with any of the executive officers or directors of the Company. There are no arrangements or understandings between Mr. Corrao and any other person pursuant to which he was elected as an officer of the Company. The Company is not aware of any transactions in which Mr. Corrao has an interest that would require disclosure under Item 404(a) of Regulation S-K.
Ottawa, Illinois – February 19, 2019 – Ottawa Bancorp, Inc. (NasdaqCM: OTTW), the holding company for Ottawa Savings Bank FSB, announced today that its Board of Directors has approved an increase in the Company’s quarterly cash dividend from $0.05 per share to $0.06 per share. The increased quarterly dividend will be paid on or about March 28, 2019, to stockholders of record as of the close of business on March 8, 2019. THE WOODLANDS, TX – FEBRUARY 21, 2019 – Newpark Resources, Inc. (NYSE: NR) today announced that after 13 years of service, Gary L. Warren informed the Nominating and Corporate Governance Committee of the Company’s Board of Directors, that he intends to retire following the Annual Meeting of Stockholders in May 2019. 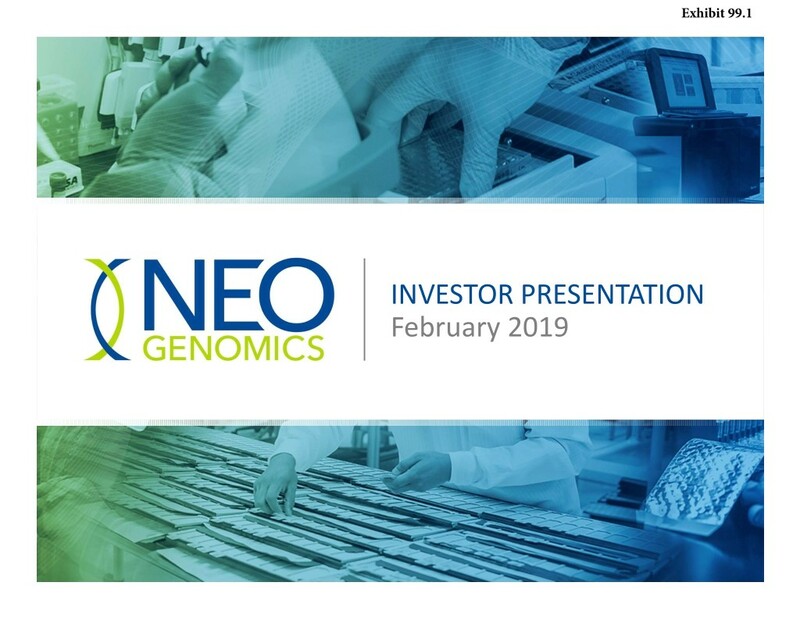 In a SEC filing dated 2018-02-21, Neogenomics Inc released their full Feburary 2019 Investor presentation. DANBURY, Conn. & RESEARCH TRIANGLE PARK, N.C. – February 21, 2019 – IQVIA™ (NYSE:IQV) today announced the appointment of Carol J. Burt to its board of directors, effective today. A principal of private investment firm Burt-Hilliard Investments for more than a decade, Burt is a former executive officer of WellPoint, Inc. (now Anthem, Inc.), lastly as Senior Vice President, Corporate Finance and Development, and previously served as Senior Vice President and Treasurer of American Medical Response. Burt also serves on the operating council and as a senior advisor to Consonance Capital Partners. Burt currently serves on the board of directors of ResMed Inc. and WellDyneRx, LLC. She previously served on the boards of directors of Envision Healthcare, WellCare Health Plans, Inc., Vanguard Health Systems, Inc., and Transitional Hospitals Corporation. She’s an active member of Women Corporate Directors and recently served as Chair of the Fortune 1000 Working Group for the Women’s Leadership Foundation of Colorado. The 2019 Bruker Corporation (“Bruker” or the “Company”) Short-Term Incentive Compensation Program (the “ICP” or “Program”) is designed to reward management employees and key personnel for performance that contributes significantly to the Company’s growth and financial success. The Program is designed to reward several layers of success at the Bruker Corporate, Group, Divisional, Business Unit, functional, and individual levels, while maintaining a focus on significant improvement over prior year results. Incentive Awards under this Program are granted as “Cash-Based Awards” pursuant to and in accordance with the terms of the Bruker Corporation 2016 Incentive Compensation Plan (the “2016 Plan”). Select executive and key employees in the Company are eligible to participate in the Program, as the Company may determine at its discretion. Sales commissioned employees and employees participating in any other cash-based incentive plan are not eligible to participate in the ICP. Employees participating in this ICP are generally not eligible to participate in any other cash-based incentive plan. The Incentive Award for any employee who becomes eligible to participate in the Program after the beginning of the Performance Period shall be pro-rated based on their participation date. Employees must become eligible prior to November 15th in order to participate. Participants must be active employees on payroll on the payout date to receive an Incentive Award. To be eligible to receive any Incentive Award under the Program, the employee must be considered in good standing as determined by the Company in its sole discretion and may not be on a performance improvement plan. Each Participant shall have a pre-determined Incentive Target, typically expressed as a percentage of the individual’s base salary. Additionally, the conditions to achieve the Incentive Target shall also be pre-determined. Achievement of a Participant’s Incentive Target typically depends on a combination of Company or business achievement of financial goals and individual objectives, with weightings assigned to each based on Company discretion and Participant level in the organization. Incentive Award payouts are calculated and paid annually based on Company and individual performance relative to the goals, such that actual Incentive Award payouts can be below, at, or above the Incentive Target. For purposes of this Program, financial goals may be determined pursuant to generally accepted accounting principles (GAAP) or on a non-GAAP basis and may include the following metrics or variations thereof: earnings per share (EPS); pre-tax or after-tax net income; operating income or profit; cash flow; gross or net revenues; gross or net sales; costs (including cost reductions); margins; units sold; market share; stock price; total shareholder return; return on sales, assets, equity, capital or investment; earnings before deducting one or more of interest, taxes, depreciation and amortization; capital expenditures; working capital; inventory decrease; effective tax rate in one or more jurisdictions; planning for, or completion or implementation of, acquisitions or divestitures of specific product lines, business segments, business units, divisions or subsidiaries; or other balance sheet or income statement objectives approved by the Compensation Committee (the “Committee”). Performance measures may be set at the consolidated level, segment level, division level, group level, or business unit level. Additionally, performance measures may be measured either annually or cumulatively over a period of years, and on an absolute basis or relative to pre-established targets, a previous year’s results or to a designated comparison group, in each case as specified by the Committee. Differences in weightings of financial goals, or the financial goals themselves, may exist between the Corporate and Group/Divisional financial metrics to reflect organizational scope, responsibility, and shareholder expectations. Each of the metrics may also be weighted to reflect the relative importance of each of the goals. Participants in the operating groups may have a portion of their financial goals tied to their direct area of responsibility or some other area related to their responsibility (e.g., an organization that is “1-up” from their current direct area of accountability) to encourage teamwork, collaboration, and alignment across the organization. Financial goals have a minimum of 0% payout and no maximum, with payouts determined relative to the achievement of each of the specified performance goals on a linear basis, e.g., 110% performance results in 110% payout for any one financial metric. All individual goals will be established with the Participant’s manager and approved by the appropriate executive officer, where appropriate. Individual performance will be assessed based on achievement of individual goals. Payouts will be determined based on the manager’s assessment of individual performance relative to each of the specified goals. Individual performance has a minimum payout of 0% and a maximum payout of 125%. Results of the financial goals relative to their respective targets will be multiplied by the corresponding payout percentage tied to the specific level of performance for each goal. Those products will then be added together to derive the final payout percentage for the financial portion of the award. Results of the individual goals will be used in determining the overall payout for the individual portion of the award. While there is no maximum on any one particular financial goal, the total Incentive Award payout under the Program for financial goals is subject to a maximum payout of 200% of the Participant’s Incentive Target for financial goals. Annual Incentive Awards earned under the ICP will be paid shortly after audited results are approved by the Company’s Board of Directors and reported by the Company. All Incentive Awards payable under the Program are subject to applicable federal, state, and local withholding tax and any such other taxes as may be required. The terms and conditions of the Program are subject to the provisions of the 2016 Plan. The Committee is responsible for approving the Program, Incentive Targets, and other metrics thereof, and for administering the Program in accordance with and subject to the terms and conditions of the 2016 Plan. The Committee shall have full and sole authority to interpret the Program, to establish and amend rules and regulations relating to it, and to make all other determinations necessary or advisable for the administration of the Program, unless otherwise delegated to the Company’s CEO and CFO. The Company reserves the right to amend, modify, suspend or terminate the Program at any time solely in its discretion with or without notice to Participants. Nothing contained herein shall in any way alter the nature of employment at the Company or constitute a contract of employment or in any way be construed to confer on the Participant any right to continue as a participant in the 2016 Plan or the Program or as an employee of the Company or any subsidiary of the Company. The Committee may, in its sole discretion and in accordance with and subject to the terms of the 2016 Plan, adjust Incentive Targets to take into account the effects of any Extraordinary Items. “Extraordinary Items” means unusual or nonrecurring events affecting the Company or the financial statements of the Company, such as, but not limited to, (a) effects of changes in foreign exchange, (b) an unbudgeted material expense incurred by or at the direction of the Board of Directors or a committee thereof, (c) a material litigation judgment or settlement, (d) effects of mergers, acquisitions, divestitures, spin-offs, consolidation, acquisition of property or stock, reorganizations, restructuring charges, or joint ventures, or (e) changes in applicable laws, regulations, or accounting principles. After the Performance Period has ended, the Participant will be entitled to receive a payout based on the value of the Incentive Award earned by the Participant over the Performance Period, taking into account the extent to which the corresponding performance goals were achieved. Notwithstanding the foregoing, if an employee resigns voluntarily, or is terminated for performance reasons or for violation of Company policies prior to the time of the Incentive Award payout, he/she will not be eligible to receive any portion of the Incentive Award. If an employee is terminated involuntarily for reasons other than performance or violation of Company policies prior to the end of a Performance Period, the Company may, in its sole discretion, determine whether to pay any portion of the Incentive Award, taking into account such things as individual performance and length of time the employee performed in the designated role during the Performance Period. Participant’s organization with the Company’s Code of Conduct and other policies. In the event the CEO or CFO determine, in their sole respective discretion, that a Participant’s performance, or that of the Participant’s organization, has failed to meet the minimum standard of performance reasonably expected of such Participant, the Participant will receive only such portion of his or her Incentive Awards calculated as payable in respect of individual goals, or none of such portion of Incentive Awards in respect of individual goals, as may be so determined by the CEO or the CFO, or, in the case of the CEO and CFO, by the Committee. In addition, in the event such failure to achieve minimum performance expectations is due to a material violation of the Code of Conduct or other Company policies which fall within the Participant’s area of responsibility, either individually or with respect to Participant’s organization, the ability of the CEO, CFO or Committee to reduce or eliminate the portion of Incentive Awards calculated as payable in respect of such individual goals shall be extended to and include the ability to eliminate or reduce the payment of amounts calculated as payable pursuant to the achievement of the financial goals. Payments made to any Participant pursuant to an Incentive Award shall be subject to clawback: (1) to the extent of the excess of what would have been paid to the participant under a Restatement (as defined below), (2) in the event that a Participant, during employment or other service covered by this Program, shall engage in activity detrimental to the business of the Company, (3) as required by any clawback policy implemented by the Company, or (4) as otherwise required by any provision of any law, government rule or regulation, or stock exchange listing requirement. For the purposes of the Program, “Restatement” means, with respect to any payment under an Incentive Award, a restatement of previously filed financial statements that is required to be prepared and filed at any time during the three-year period following such payment due to material noncompliance of the Company with any financial reporting requirements under the United States federal securities laws. All interpretations and determinations, including determinations of the amount of Incentive Awards due any Participant, made by the Committee or its delegate(s) shall be final and binding on all persons. The Company shall have the right to withhold from any amount payable hereunder any amount it reasonably determines is sufficient to satisfy all federal, state and local or non-U.S. withholding tax requirements on any Incentive Award under this Program and to take such other action as may be necessary or advisable in the opinion of the Company to satisfy all obligations for withholding of such taxes. This Program applies to all employees globally, with such adjustments for local law and local business and accounting practices as the Committee may determine. (1) If an Incentive Award is continued or assumed and within the lesser of the expiration of the Performance Period and 24 months following the Change in Control the Company (or its successor) involuntarily terminates the Participant without Cause (as defined below) or the Participant voluntarily terminates for Good Reason (as defined below) then, upon such termination, the Incentive Target payout opportunity under such Incentive Award will be deemed to have been earned on a pro rata basis for that portion of the Performance Period(s) completed as of the effective date of such qualifying termination and will be paid to the Participant within thirty (30) days following such termination, unless the acceleration of payment would result in additional taxes under Section 409A of the Internal Revenue Code. (2) If an Incentive Award is not continued or assumed, the Incentive Target payout opportunity under such Incentive Award will be deemed to have been earned on a pro rata basis for that portion of the Performance Period completed as of the effective date of such Change in Control and will be paid to the Participant within thirty (30) days following such Change in Control, unless the acceleration of payment would result in additional taxes under Section 409A of the Internal Revenue Code. The obligations of the Company under this Program shall be unsecured and unfunded obligations, and to the extent that any Participant acquires a right to receive a payment under this Program, such right shall be no greater than the right of an unsecured general creditor of the Company and no Participant shall have any right, title or interest in any of the assets of the Company or its affiliates. No assets of the Company or its affiliates shall be held under any trust, or held in any way as collateral security for the fulfilling of the obligations of the Company under this Program. Any and all assets of the Company and its affiliates shall be, and remain, the general unpledged, unrestricted assets thereof. garnishment, attachment, pledge or in any manner; no attempted assignment or transfer thereof will be effective; and no right or interest of any Participant under the Program and any Incentive Award will be liable for, or subject to, any obligation or liability of such Participant. This Program, and all agreements hereunder, shall be construed in accordance with and governed by the laws of the State of Delaware, without reference to principles of conflict of laws which would require application of the law of another jurisdiction. This Program, together with the 2016 Plan, constitutes the entire agreement of the Company with respect to the subject matter thereof and cannot be modified by any oral statement or otherwise except by written action of the Committee. 2016 Plan: The Bruker Corporation 2016 Incentive Compensation Plan. Cause: For purposes of termination of employment following a Change in Control, “Cause” shall mean dishonesty with respect to the Company or any of its affiliates, breach of fiduciary duty, insubordination, substantial malfeasance or non-feasance of duty, unauthorized disclosure of confidential information, material failure or refusal to comply with Company’s published policies generally applicable to all employees, and conduct materially harmful to the business of the Company or any of its affiliates. v) if the members of the Board as of the date of commencement of the applicable Performance Period (the “Incumbent Board”) cease to represent at least two-thirds of the Board; provided, that any person becoming a director subsequent to the date hereof whose election, or nomination for election by the Company’s stockholders, was approved by at least two-thirds of the members comprising the Incumbent Board (either by a specific vote or by approval of the proxy statement in which such person is named as a nominee for director without objection to such nomination) shall be, for purposes of this paragraph (v), treated as though such person were a member of the Incumbent Board. Committee: The Compensation Committee of Bruker Corporation, as set forth in Section 3 of the 2016 Plan. Good Reason: Unless otherwise defined in a written Incentive Award, employment, severance or similar agreement between the Participant and the Company, “Good Reason” means, without the Participant’s prior written consent, (i) a material diminution in a Participant’s authority, duties, or responsibilities, (ii) a material breach by the Company or its successor of its obligations to a Participant under any written employment, severance or similar agreement, (iii) a material diminution in the Participant’s base compensation plus incentive compensation opportunity, or (iv) the relocation of the Participant’s primary work location to a location more than 50 miles from the Participant’s primary work location immediately prior to a Change in Control. A Participant may not resign for Good Reason without providing the employer written notice of the grounds that the Participant believes constitute Good Reason within 90 days of the initial existence of such grounds and giving the Company or its successor at least 30 days after such notice to cure and remedy the claimed event of Good Reason. Incentive Award: The award payout under the Program. Incentive Target: The incentive opportunity expressed as a percent of the Participant’s base salary. Participant: A specified employee who has met the eligibility criteria outlined in accordance with the Program. Performance Period: The period of time for which performance goals are measured for purposes of determining the awards earned under this Program, generally January 1 through December 31. Program: The Bruker Corporation 2019 Short-Term Incentive Compensation Program. On February 18, 2019, the Compensation Committee of the Board of Directors (the “Committee”) of Diodes Incorporated (the “Company”) approved the payment of a cash bonus to certain executive officers of the Company for their services rendered in fiscal 2018 pursuant to an executive bonus formula adopted by the Committee on February 8, 2018. The cash bonus for each executive is based on a multiple of that executive’s salary and consists of two components: a Company-wide performance component which accounts for 80% of the bonus; and an individual performance component which accounts for 20% of the bonus. The Company-wide performance component is based on achievement of a revenue target and a non-GAAP earnings per share target, which are weighted 20% and 80%, respectively. The performance targets were to reflect stock holder objectives of profitability, growth and revenue. The individual performance component is based on the Committee’s assessment of the individual’s overall performance. If the Company achieves the Company-wide performance targets and the executive achieves his individual performance objectives, the executive will be entitled to receive 100% of his target bonus. Achievement of 80% of the performance targets would result in a bonus equal to 50% of the target bonus, and achievement of 120% of the performance targets would result in a bonus of 200% of the target bonus. Achievement of less than 80% of the performance targets would result in the payment of no bonus, and achievement of more than 120% of the performance targets would not result in the payment of a bonus of more than 200% of the target bonus. In December 2018, based upon (1) the unaudited results of operations of the Company for the nine months ended September 30, 2018, (2) the projected results of operations of the Company for the three months ended December 31, 2018, and (3) the performance of each executive officer toward their individual performance objectives, the Committee approved the payment of 80% of such target bonuses on or before December 31, 2018. On February 18, 2019, the Committee, based on the actual performance of the Company and performance of individual objectives determined the actual bonuses to which each executive officer was entitled for fiscal 2018 and approved the payment of the balance of the bonuses after the filing of the Company’s 2018 Annual Report on Form 10-K.
Valley Ranch Apartments located in Ann Arbor, Michigan Acquired by Lightstone Value Plus Real Estate Investment Trust V, Inc.
Ann Arbor, Michigan / February 14, 2019 / Lightstone Value Plus Real Estate Investment Trust V, Inc. (the “Company”), through LVP BH Valley Ranch LLC (“LVP BH Valley Ranch”), a subsidiary of Lightstone REIT V OP LP, the Company’s operating partnership, entered into an Assignment and Assumption of Purchase and Sale Agreement (the “Assignment”) with LVP BH Acquisitions LLC (the “Assignor”), an affiliate of the Company’s advisor, an affiliate of the Lightstone Group, LLC. Under the terms of the Assignment, LVP BH Valley Ranch was assigned the rights and assumed the obligations of the Assignor with respect to that certain Agreement of Purchase and Sale (the “Purchase Agreement”), dated December 10, 2018, as amended, made between the Assignor, as the purchaser, and Tilden Valley Ranch Apartments LLC (the “Seller”) as the seller, whereby the Assignor contracted to purchase a 384-unit multifamily property located in Ann Arbor, Michigan (the “Valley Ranch Apartments”). On February 14, 2019, the Company, through LVP BH Valley Ranch, completed the acquisition of the Valley Ranch Apartments from the Seller, an unrelated third party, for approximately $70.3 million, excluding closing and other acquisition related costs. In connection with the acquisition of the Valley Ranch Apartments, the Company simultaneously entered into a $43.4 million mortgage loan (the “Loan”) scheduled to mature on March 1, 2026. The Loan requires monthly interest payments through its maturity date and bears interest at 4.16% through its maturity. The Loan is collateralized by the Valley Ranch Apartments and is non-recourse to the Company. In connection with the acquisition, the Company’s advisor, an affiliate of the Lightstone Group, LLC, received an aggregate of approximately $1.2 million in acquisition fees, acquisition expense reimbursements and debt financing fees. LVP BH Valley Ranch also entered into a management agreement with an affiliate of the Company’s advisor, an affiliate of the Lightstone Group, LLC, for the management of theValley Ranch Apartments commencing on February 14, 2019. The capitalization rate for the acquisition of the Valley Ranch Apartments was approximately 5.35%. The Company calculates the capitalization rate for a real property by dividing the net operating income (“NOI”) of the property by the purchase price of the property, excluding costs. For purposes of this calculation, NOI was based upon the twelve months ended November 30, 2018. Additionally, NOI is all gross revenues from the property less all operating expenses, including property taxes and management fees but excluding depreciation. Kansas City, Mo., Feb. 21, 2019 – Evergy, Inc. (NYSE: EVRG) today announced full year 2018 earnings of $536 million, or $2.50 per share, compared with earnings of $324 million, or $2.27 per share, for the full year 2017. For the fourth quarter 2018, earnings were $19 million, or $0.07 per share, compared with earnings of $34 million, or $0.24 per share, for the fourth quarter of 2017. In June 2018, Westar Energy, Inc. (Westar Energy) and Great Plains Energy, the parent company of Kansas City Power & Light (KCP&L) and KCP&L Greater Missouri Operations (GMO), completed their merger to create Evergy. Evergy’s 2018 fourth quarter earnings include Westar Energy, KCP&L and GMO earnings for the entire quarter. Comparison to 2017 earnings are based on Westar Energy’s earnings for that period. The earnings increase in 2018 compared to 2017 was primarily due to the inclusion of KCP&L and GMO earnings, higher Westar retail sales, driven by favorable weather, and lower income tax expense, partially offset by merger related costs and customer bill credits following the close of the merger. Evergy announced full year 2018 pro forma earnings of $714 million, or $2.67 per share, which reflect the consolidated results of operations of Evergy as if the merger had taken place on January 1, 2017, and exclude non-recurring merger-related costs, compared with 2017 pro forma earnings of $469 million, or $1.73 per share. For the fourth quarter 2018, pro forma earnings were $20 million, or $0.08 per share, compared with a loss of $69 million, or $0.25 per share, for the fourth quarter of 2017. Increased sales, due primarily to favorable weather, and lower income tax expense contributed to the year-over-year increase in pro forma earnings. The Board of Directors declared a dividend of $0.475 per share payable on March 20, 2019, on the Company’s common stock. The dividends are payable to shareholders of record as of March 4, 2019.
by dialing (888) 353-7071, conference ID 1169956. A webcast of the live conference call will be available at www.evergyinc.com. This earnings announcement, a package of detailed full-year financial information, the company’s annual report on Form 10-K for the period ended December 31, 2018 and other filings the company has made with the Securities and Exchange Commission are available on the Company’s website at www.evergyinc.com. Evergy, Inc. (NYSE: EVRG), through its operating subsidiaries, KCP&L and Westar Energy provides clean, safe and reliable energy to 1.6 million customers in Kansas and Missouri. The 2018 combination of KCP&L and Westar Energy to form Evergy created a leading energy company that provides value to shareholders and a stronger company for customers. The unaudited pro forma financial information included in this press release has been presented for informational purposes only and is not necessarily indicative of Evergy’s consolidated results of operations that would have been achieved or the future consolidated results of operations of Evergy. The unaudited pro forma financial information should be read in conjunction with Evergy’s annual report on Form 10-K for the period ended December 31, 2018. Statements made in this press release that are not based on historical facts are forward-looking, may involve risks and uncertainties, and are intended to be as of the date when made. Forward-looking statements include, but are not limited to, statements relating to the expected financial and operational benefits of the merger of Great Plains Energy Incorporated (Great Plains Energy) and Westar Energy that resulted in the creation of Evergy (including cost savings, operational efficiencies and the impact of the merger on earnings per share), cost estimates of capital projects, dividend growth, share repurchases, balance sheet and credit ratings, rebates to customers, the outcome of regulatory and legal proceedings, employee issues and other matters affecting future operations. In connection with the safe harbor provisions of the Private Securities Litigation Reform Act of 1995, Evergy, Westar Energy and KCP&L are providing a number of important factors that could cause actual results to differ materially from the provided forward-looking information. These important factors include: future economic conditions and any related impact on sales, prices and costs; prices and availability of electricity in wholesale markets; market perception of the energy industry, Evergy, Westar Energy and KCP&L; changes in business strategy or operations; the impact of unpredictable federal, state and local political, legislative, judicial and regulatory actions or developments, including, deregulation, re-regulation and restructuring of the electric utility industry; decisions of regulators regarding rates that Westar Energy and KCP&L (or other regulated subsidiaries of Evergy) can charge for electricity; changes in applicable laws, regulations, rules, principles or practices, or the interpretations thereof, governing tax, accounting and environmental matters, including air and water quality; quality and waste management and disposal; changes in the energy trading markets in which Westar Energy and KCP&L participate, including retroactive repricing of transactions by regional transmission organizations and independent system operators; the impact of climate change, including reduced demand for coal-based energy because of actual or perceived climate impacts and the development of alternate energy sources; financial market conditions and performance, including changes in interest rates and credit spreads and in availability and cost of capital and the effects on derivatives and hedges, nuclear decommissioning trust and pension plan assets and costs; impairments of long-lived assets or goodwill; credit ratings; inflation rates; effectiveness of risk management policies and procedures and the ability of counterparties to satisfy their contractual commitments; impact of terrorist acts, including cyber terrorism; ability to carry out marketing and sales plans; weather conditions, including weather-related damage and the impact on sales, prices and costs; cost, availability, quality and timely provision of equipment, supplies, labor and fuel; the inherent uncertainties in estimating the effects of weather, economic conditions, climate change and other factors on customer consumption and financial results; ability to achieve generation goals and the occurrence and duration of planned and unplanned generation outages; delays in the anticipated in-service dates and cost increases of generation, transmission, distribution or other projects; Evergy’s ability to successfully manage its transmission and distribution development plans and its transmission joint ventures; the inherent risks associated with the ownership and operation of a nuclear facility, including environmental, health, safety, regulatory and financial risks; workforce risks, including increased costs of retirement, health care and other benefits; the possibility that the expected value creation from the merger will not be realized, or will not be realized within the expected time period; difficulties related to the integration of the two companies; disruption from the merger making it more difficult to maintain relationships with customers, employees, regulators or suppliers; the diversion of management time; and other risks and uncertainties. This list of factors is not all-inclusive because it is not possible to predict all factors. Additional risks and uncertainties are discussed from time to time in quarterly reports on Form 10-Q and annual reports on Form 10-K filed by Evergy, KCP&L and Westar Energy with the SEC. Each forward-looking statement speaks only as of the date of the particular statement. Evergy, KCP&L and Westar Energy undertake no obligation to publicly update or revise any forward-looking statement, whether as a result of new information, future events or otherwise.